Flapjacks, oh my…I want one, hmm two, now! I blame fellow blogger, Fatmandoo, for tantalizing me with his recipe & pictures of his flapjacks (or mini pancakes) when I read his posting recently. I suddenly had to, but just had to make them. They looked so more-ish and delicious. However, I did not have the necessary ingredient, namely almond flour. So I got creative and ground my almond nuts, which were a chunkier texture than the shop bought almond flour….but it still worked! YUMMY. Craving satisfied. Now if you don’t have almond flour, which I had run out of, get the equivalent volume which is 100g (actually 96g, but who cares about that extra 4g) of almond nuts or nibs or flakes. Place this in a food processor and pulverize until it resembles crumbs. Now he suggests cooking over a medium heat. My gas stoves medium heat simply caused the effect on the left side of the image, HOWEVER on my lowest setting, it created the picturesque & more-ish flapjack I was craving. So do a dummy run with a small amount to check what best works on your stove. They cook identically to flapjacks where the little bubbles come through to show it’s ready to be turned over, the only difference, is since the mixture is not being bound by gluten, you need to be gentle in turning them around! 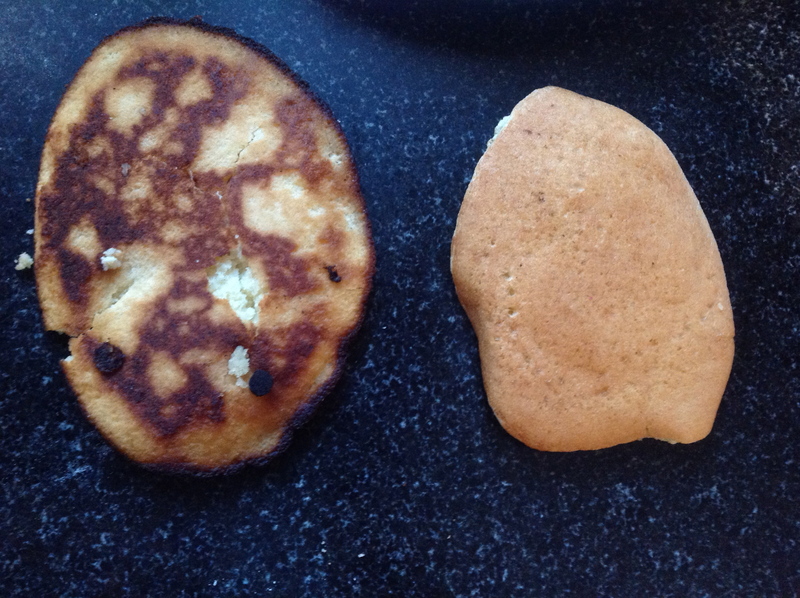 This entry was posted in Breakfast, Dessert, LCHF recipes, Rolls and the like and tagged almond flour, almonds, Atkins, banting, flapjacks, LCHF, low carb flapjacks, low carb pancakes, paleo, pancakes, zerotohero by angelb38. Bookmark the permalink.